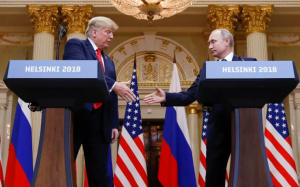 With another summit on the horizon for President Trump and Vladimir Putin, perhaps as early as this fall, will the future of U.S.-Russian relations largely hinge on such meetings? An editorial in the new issue of The Nation — “Parsing the Surreal From the Sensible in Trump’s Helsinki Performance” — calls for protecting the security of U.S. elections while pursuing diplomatic initiatives with Russia. Vanden Heuvel is scheduled to appear on CNN’s “Fareed Zakaria GPS” this Sunday (July 22). The Nation editorial says: “With Trump’s own director of national intelligence — conservative former Republican senator Dan Coats — concluding that Russian interference continues to this day, Trump refused to publicly denounce that interference or warn Putin against persisting in it. Foreign powers, corporations, and billionaires may well see this as a green light for increased meddling in U.S. elections. “Worse, the administration and the Republican-controlled Congress have done virtually nothing to bolster free elections or protect them from such meddling. Our digital-age voting systems are vulnerable to hackers based anywhere. The solutions will require a much higher level of security for everything from voter-registration records to the tabulation of ballots with verifiable paper trails. But the greatest threat to our elections comes from hyper-partisan politics: gerrymandering electoral districts, erecting obstacles to registration and voting, purging voter rolls, gutting the Voting Rights Act, and, of course, facilitating the flow of big money — much of it undisclosed — into political campaigns. Under the Republicans, Congress has blocked sensible election-law reform. And right-wing donors and activists continue to push voter-suppression schemes at the state level — schemes that would be given even freer rein if Brett Kavanaugh is confirmed as the next Supreme Court justice. Citizens must demand reforms, and hold politicians accountable if they stand in the way. A petition in support of the open letter, “Common Ground: For Secure Elections and True National Security,” has been signed by more than 40,000 people since last week. Initial signers include Pentagon Papers whistleblower Daniel Ellsberg; writer and feminist organizer Gloria Steinem; activist leader Rev. Dr. William Barber II; Pulitzer Prize-winning writers Alice Walker and Viet Thanh Nguyen; Nobel Peace Prize winner Jody Williams; former senator Adlai Stevenson III; Russia scholar Stephen F. Cohen; former longtime House Armed Services Committee member Patricia Schroeder; political analyst Noam Chomsky; former UN ambassador Gov. Bill Richardson; TV public-affairs pioneer Phil Donahue; former Nixon White House counsel John Dean; and former covert CIA operations officer Valerie Plame.